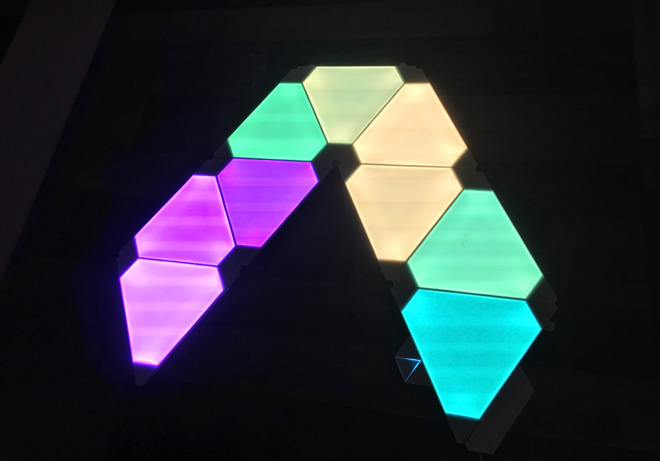 Taking yet another unorthodox approach to lighting, Nanoleaf's Light Panels are thin triangles that link together to form bigger, color-shifting polygons. You can create some especially wild shapes if you have a large bank account, even wrapping them around walls and ceilings if you pick up Nanoleaf's special flex linkers and screw mounts. The basic Rhythm Edition kit includes nine panels and connectors, as well as a controller unit, sticky strips, and of course the Rhythm module. 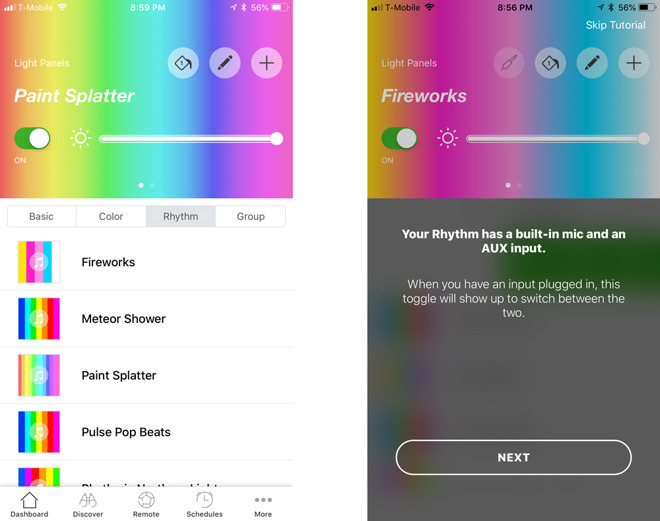 After a firmware update, the Rhythm enables animations in response to ambient audio. We'll get into more depth with that in our upcoming review, but we should start by saying that it can take surprisingly long to install even the basic kit, depending on your ambitions and the walls you plan to put them on. The fastest things can move is if you happen to have perfectly smooth walls and you're mounting at eye level or lower. Even then, though, Nanoleaf suggests applying three sticky strips per panel, and pressing them against the wall for at least 30 seconds. With nine panels, that adds up. In our case the install ended up taking days. We quickly realized that the stucco-like surfaces in our test house would be a problem, so we ended up making a trip to Home Depot to buy paneling, drywall screws, and a stud finder. Even this wasn't enough, since we discovered that Nanoleaf's bundled mounting strips just didn't cut it on the paneling anyway, prompting us to make another shopping run in which we picked up some of Scotch's "Extremely Strong" strips, ususally designed for much heavier objects. That finally did the trick. The results have been very pleasing though, so far. Even more so than the Beam and Tile, the Light Panels immediately draw attention from anyone in the room, even when they're not animated. Their unusual shapes are hard to ignore, and their intense brightness even more so — unlike LIFX's accessories, we could conceivably imagine using these as a primary lightsource, even if we'd want a lamp or two to fill things out. The Nanoleaf iPhone and iPad app is the starting point of software setup, and where you'll probably be spending most of your time, at least initially. While the Light Panels support HomeKit/Siri, Google Assistant, and Amazon Alexa, none of those platforms can directly take advantage of their customizable animation and per-panel colors. Scenes created in the Nanoleaf app seem to silently migrate to all three however, animations intact. That means that you can use the iOS Home app to trigger them at will or as a part of automations.